He goes by his given name of Moose, sometimes Moo, Mooey, Moo Man, Moose Papoose, Mooey Papooee, Moo Pants, and if he’s in trouble (which is rare), it’s Mussolini. He has a lot of names, but he is also called my heart dog and the four legged love of my life. When we bought a house the last thing I wanted was a dog. I like dogs, I even had a biting Basset Hound named George growing up. Because of his disposition, George only left the house for vet appointments, so he didn’t have much of a fun factor. One day I stopped in a now defunct pet store in search of a particular cat toy our kitties favored. I like to say I came in for a cat toy and left with a dog, but that’s not entirely true. The store didn’t have the toy I wanted but I always looked at the puppies for sale. (This was before I became educated on puppy mills and before volunteering at the shelter). Of course they were all adorable, but one melted by heart. A tiny blue puppy was standing on the wire floor of his cage, staring at me, wagging his tail. His tag read, “Male. Greyhound.” I had never seen a Greyhound puppy before. As it turned out, I still haven’t. My mom, who tagged along on the shopping trip, asked the clerk about the dog. His cage wasn’t labeled correctly. 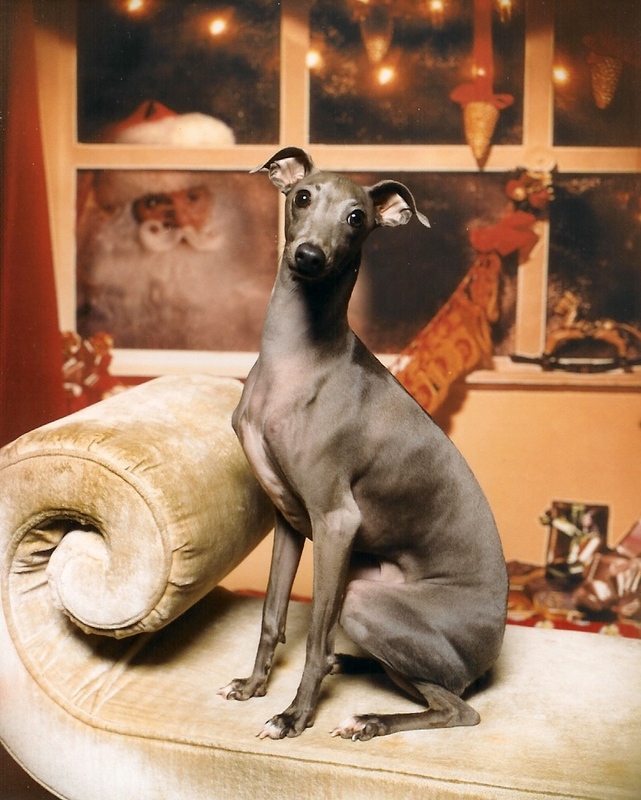 He was an Italian Greyhound, a breed that stays smaller than a Whippet. I never heard of them, and knew nothing about them. Knowing that holding him would seal the deal, my mom and I left the store. I told my husband about him, which led to a night spent researching the breed. After giving it some thought, we decided to get a dog. The next morning couldn’t come soon enough. I’m not sure which of us were more excited. Hubby wanted a Great Dane or English Bulldog, but I think he would have been happy with anything I was willing to get. We reached the store, relieved to see our puppy hadn’t been sold. The sales associate handed him to me and he immediately started cleaning my ears. I was in love. He was so young he hadn’t developed the signature tucked belly of a Greyhound. He looked like a rectangle with stick legs. It wasn’t long before he grew to look like his breed. 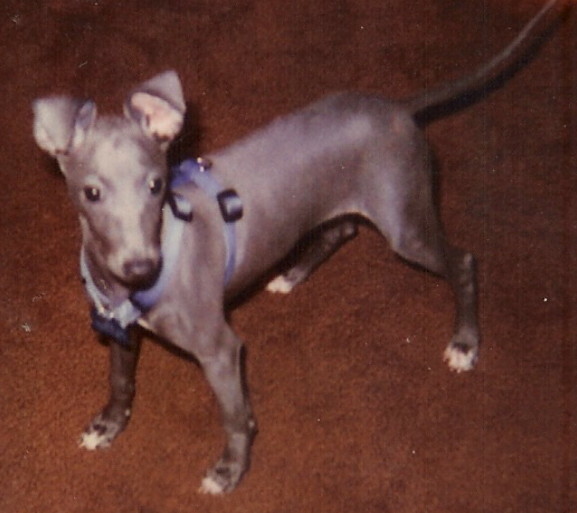 Moose was our first Italian Greyhound. We adopted his brother Red from a rescue a few years later. I joined an Italian Greyhound website, and through that we’ve made great friends, both human and canine. Moose is a laid back kind of guy, he loves people, dogs, and cats. He craves attention and enjoys exploring the world around him. He has his quirks, but in my eyes he’s perfect and can do no wrong. He’s an absolute angel until you move him from the couch and he turns into a 17 pound Cujo. We just celebrated 12 years together, and he will turn 13 on Veteran’s Day. I pray we have many more years to come but, truth be told, forever wouldn’t be long enough. I love you, Moose. 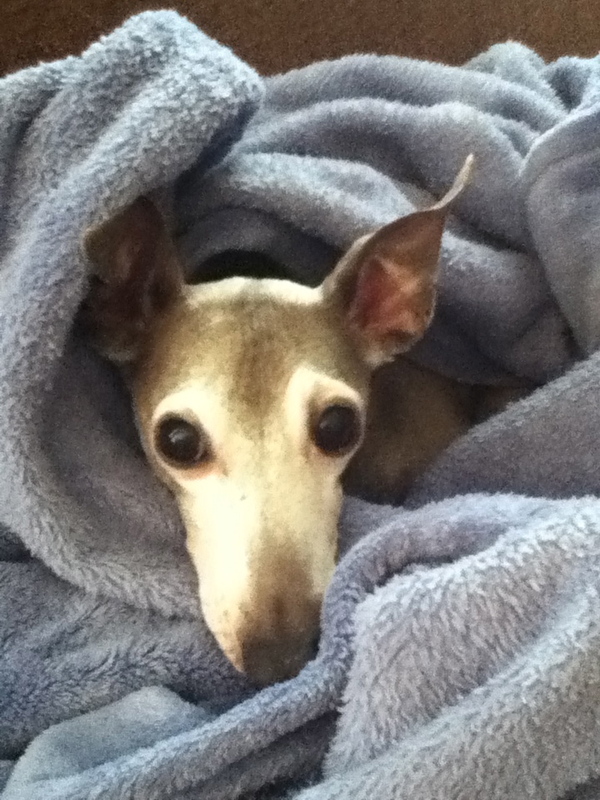 This entry was posted in mirth, Moose, pets and tagged dog, Italian Greyhound, puppy. Bookmark the permalink. Thank you for the reblog! His eyes are very expressive, I love when it looks like he’s thinking. The eyes do have it. Adorable.